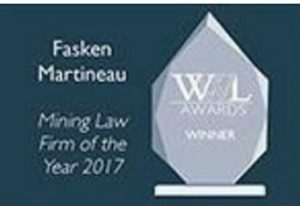 TORONTO – Who’s Who Legal has named Fasken Martineau as the Global Mining Law Firm of the Year for 2017, which is the ninth time in the past decade. Fasken Martineau is again named the world’s best mining law firm. With more than 150 years of mining experience, our Global Mining Group has earned an unparalleled international reputation. In addition, Toronto-based partner, Michael Bourassa has received the prestigious “Lawyer of the Year 2017” award for Mining. Please visit Fasken’s Global Mining Group.